As some of you may know, I am a HUGE Sea Shepherd fan. I have been a donating member of them since forever, and even had the pleasure to chat with Paul Watson when I was working for the Alaska Wildlife Alliance. They are not perfect in their execution, but they are in their mission: They are one of a very small number of activist groups that ACTUALLY get involved in the cause. They literally put their lives on the line. 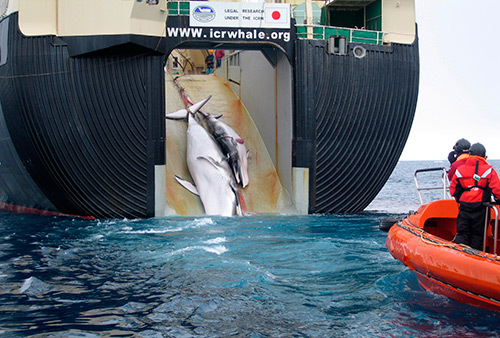 Every year, they head to the Southern Ocean to protect endangered whale species from Japan’s whaling program. While Japan uses a loophole (for research) they process and sell the whale meat back home to a rapidly dwindling customer base. This ruling from the UN’s International Court of Justice is hopefully the final blow in the battle over whaling in the Southern Ocean. The release from Sea Shepherd is here.